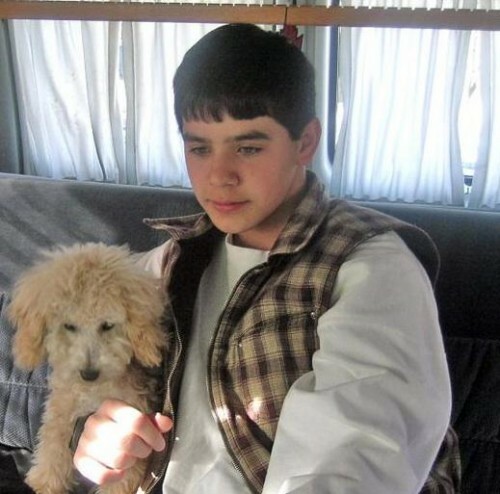 Like David Archuleta, many of his fans love dogs. As we love and care for them, they become an endearing and enduring part of our lives with family and friends. Even when we must say good-bye, we will always hold them dear to our hearts. This week our Honeybee 3cota, who usually writes the Photo of the Week, had to say good-bye to her beloved Cauley, a chocolate long-haired Dachshund who has been in the family for thirteen years. Cauley Girl died peacefully after a long illness. 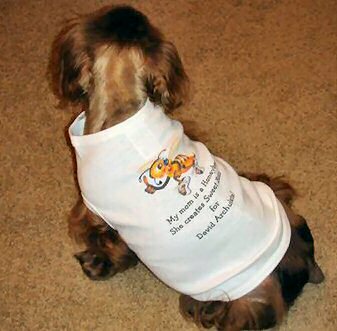 Wearing her David Archuleta Honeybees sweater, Cauley has been featured on this blog. We send 3cota our deepest heart-felt condolences at this sad, reflective time. 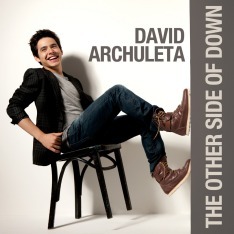 Besides music and food, a favorite subject for David Archuleta is the family pets. The Archuleta household has many of them. Recently, a furry friend joined David in the recording studio and took over the microphone. The photo of the week is an adorable family picture of David with his own canine companion. It was taken a few years ago before David’s American Idol experience. Dear 3cota: My deepest condolences on the loss of your precious Cauley Girl. I too recently suffered the loss of dear pet. Francesca was a beautiful Himalayan mix with gorgeous turquoise blue eyes. She was named after Ol’ Blue Eyes himself, Frank Sinatra. It was a difficult loss for me, especially since cancer took her before her time. I recall watching a documentary on the Monks of New Skete, a monastic order in Upstate New York that raises German Shepherds and has written books on raising and training dogs. One of the monks involved in the program explained his theory of a spiritual connection between animals and humans. It therefore comes as no surprise to me that David has such love for and a connection with family pets, since he is a very spiritual person. I’ve no doubt the animals in David’s life adore him, and I’m certain he finds it difficult to be separated from them for long periods of time due to his music career. 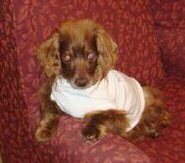 Despite deep sadness upon losing beloved pets, I cannot imagine life without them, and I am grateful for the love and happiness they bring to our lives. I loved Cauley so much and she was such a trooper in all things! And I am thankful for the 12 years that I was able to share in her life. You are so right…have not thought about that …but I can’t imagine the last 12 years without my Cauley Girl. and Minja. This was such a surprise to see Cauley sitting on David’s blog! I thought I had clicked something wrong. Thank you so much for thinking about us in this way! 3cota- I’m sorry to read about Cauley Girl. She looked like a real beautiful dog.